On October 28, 1919, The U.S. Congress passed the Volstead Act over President Woodrow Wilson’s veto, paving the way for Prohibition to begin the following January and setting the stage for the eventual production of HBO’s Boardwalk Empire. Without the almost difficult to fathom actions of Congress nearly a hundred years ago today, we would not be enjoying the tales of gangsters and corrupt politicians gracing our televisions on Sunday nights thanks to HBO. Yet, for as hard as it is for us in an age in which we are inundated constantly by beer and other alcoholic beverage commercials, for a time the United States attempted to prohibit intoxicating beverages. The long march to Prohibition began as far back as 1826 with the founding of the American Temperance Society. Women played a major role in nineteenth-century temperance societies and indeed a veritable alliance developed between women’s suffrage organizations and temperance societies. The reason for women in particular to speak out against excessive drinking of intoxicating beverages stems from a combination of physical abuse suffered at the hands of drunk husbands as well as drunk husbands engaging in adulterous relationships or risking their employment by missing work, showing up late, or even working while intoxicated. 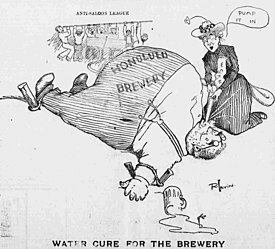 This 1902 illustration from the Hawaiian Gazette newspaper humorously illustrates the Anti-Saloon League and the Women’s Christian Temperance Union’s campaign against the producers and sellers of beers in Hawaii. With these rather vague terms that did not define what exactly constitutes intoxicating liquors, America became a dry country, much to the bafflement of the rest of the world. Making matters worse, Prohibition resulted in organized crime bosses operating speakeasies and distribution networks throughout the United States. Americans clearly were not willing to give up centuries-old customs of drinking alcohol. Those who supported the bill may have had good intentions, but instead their efforts wound up resulting in the growth of some of America’s most powerful organized crime families. In 1933, Prohibition ended when the Twenty-first Amendment repealed the Eighteenth, but the enduring cultural legacy of the Roaring Twenties, of gangsters and speakeasies remains with us to this day! Johnson, Nelson. Boardwalk Empire: The Birth, High Times, and Corruption of Atlantic City. Plexus Publishing, 2010.